The city is taking on hunger, poverty, and blight through a vibrant network of urban ag efforts and more farmers’ markets per capita than any other U.S. city. It’s a chilly spring morning in Milwaukee; rain falls softly from a pigeon-gray sky. Yet here, in a parking lot in a rundown section of town, a couple dozen volunteers have assembled for the Victory Garden Initiative‘s (VGI) ninth-annual “Blitz.” They will spend this soggy Saturday building raised-bed gardens in yards across town—from the suburbs to the urban core. Over the course of the two-week event, they will prepare more than 500 beds, adding to the 3,000 gardens VGI has already installed throughout the city. A few weekends later on the north side of town, more than 100 people gather for movie night in Alice’s Garden, a public urban farm. Picnickers spread out on a grassy area, surrounded by fragrant herbs and neat raised beds, while a group of girls dance to Lil Jon’s “Turn Down for What.” As the moon rises, they will snuggle up on blankets to watch Moana on a portable screen. 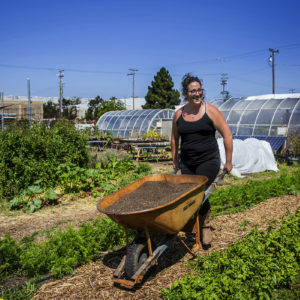 This is what community gardening looks like in Milwaukee, a Rust Belt city that has become a hive of urban agriculture over the last few decades. In addition to a multitude of backyard plots, this city of nearly 600,000 residents boasts 177 community gardens, 30 farms, and 26 farmers’ markets—more, per capita, than any other American city. Thanks to city council legislation, residents can sell produce they grow in their home gardens at farm stands and markets and are allowed to keep chickens and bees in their yards. Concurrently, a half-dozen “farm-to-table” restaurants have sprung up in the last decade. Milwaukee’s vibrant food culture is a bright spot in a city that’s working hard to reinvent itself. Like much of the industrial Midwest, Milwaukee has been hemorrhaging manufacturing jobs since the 1960s. Almost 30 percent of the city’s population lives in poverty—twice the rate for the nation as a whole. Racial tensions are palpable here as well. As the most segregated metropolitan region in the country, Milwaukee is statistically one of the worst places for African-Americans to live. Last summer, after a police officer shot Sylville Smith, a 23-year-old Black man, during a traffic stop, the city was convulsed by the worst racial unrest in 50 years. Despite the city’s difficulties, a number of factors have positioned Milwaukee to become a pioneer in urban gardening. First is its location in a farm state with several colleges of agriculture and public health and an active cooperative extension system, which started promoting urban agriculture back in the 1960s—before it was cool. Second, there’s its surplus of vacant lots, remnants of the Great Recession, often used as growing spaces. Additionally, Milwaukee is home to several urban agriculture champions. Tom Barrett, who has served as Mayor since 2004, supports all things green and sustainable. 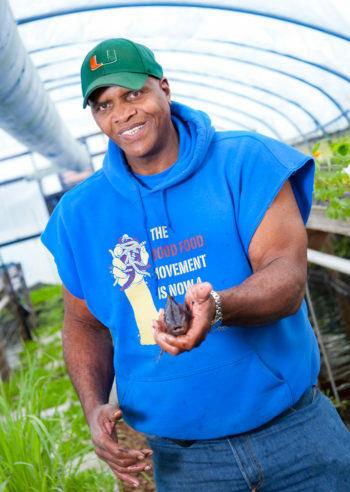 And urban agriculture icon Will Allen, founder of Growing Power, also looms large in this city’s food movement. Allen showed it is possible to produce astounding quantities of food year-round in unpromising urban environments, winning a MacArthur “genius award” in 2008 and making TIME’s list of 100 Most Influential People in 2010. He now trains gardeners across the country and the world. While some of Milwaukee’s active urban gardeners have been at it for decades, following traditions passed down through the generations, others—fed up with what they see as a broken food system—have turned to the soil more recently. Despite their varied backgrounds and histories, Milwaukee’s gardeners share many goals, both practical and profound: They want to feed their families healthful, nutritious, affordable food; they want to reconnect with the land, with their history, with one another; and others even hope to heal divisions that have plagued Milwaukee—and our nation as a whole. Is urban gardening the key to making that possible? Named for the gardens Americans planted during the first and second World Wars to free up resources for the war effort, the Victory Garden Initiative has come a long way from its ragtag start. 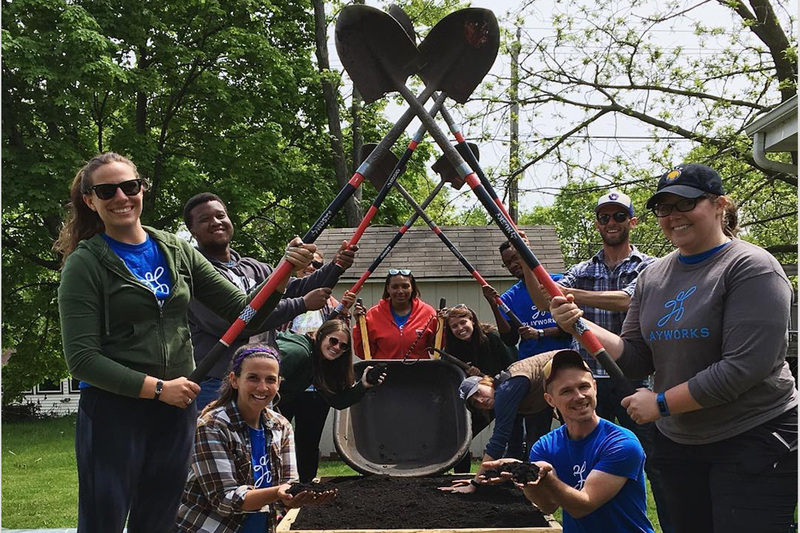 Today, with a staff of five and dozens of loyal volunteers, the group makes backyard gardening accessible to virtually anyone in Milwaukee. 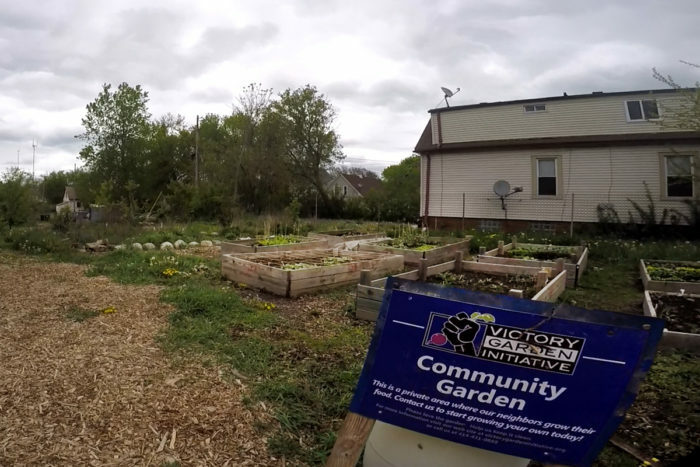 For a small fee—as little as $20 for low-income residents—VGI will build a raised bed, fill it with soil, and follow up with seeds and gardening lessons. VGI also maintains a 1.5-acre urban farm, trains food leaders and young gardeners, and plants fruit and nut trees throughout the city. 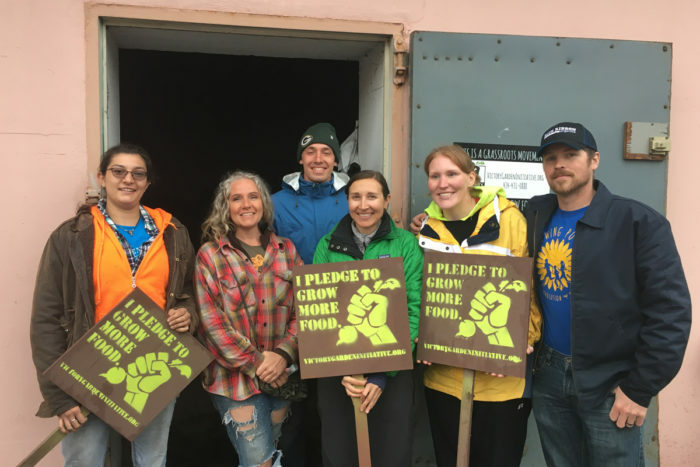 Dressed in a flannel shirt and ripped jeans, her long gray-blond hair pulled into a messy bun, executive director Gretchen Mead has a clear vision of what “victory” means today: She wants to see communities grow their own food, creating a socially just, environmentally sustainable, nutritious food system for all. Inside Alice’s Garden gates, there are 122 irrigated garden plots that can be rented for $15 to $50 a year. There are also yoga classes, movie nights, reading circles, a jobs program for teens, and an annual women’s full-moon retreat. Milwaukee’s urban gardeners are indeed a diverse lot, as are their motivations. For some, it’s simply about the food. “It just tastes better than the stuff you get at the grocery store that’s traveled 2,500 miles,” said one VGI volunteer, a self-described conservative. Gardening is a viable option for those who want to eat organic food but can’t afford to shop at Whole Foods. “It’s good to actually know that there’s no pesticides on it, that it’s fresh and real,” said Judy, a recipient of a raised-bed VGI garden in her yard. Additionally, gardening gets people off the couch and out of the house. “Most of us go from our house boxes to our car boxes, and we just don’t go outside,” said Lyness Barnette, a volunteer at VGI’s urban farm. For Sid Singh, a doctor in a local hospital volunteering during VGI’s Blitz, gardening conjures memories of his childhood in India, where his family maintained a small kitchen garden. “I would pick vegetables right off the plant and eat them,” he recalled. Tim McCollow, program manager of Home Gr/own Milwaukee (also known as “the Mayor’s food guy”), ticks off well-documented benefits of healthy, green spaces: stabilizing crime, raising property values, helping people eat better. And gardens can cement community. Raising the next generation of gardeners (and eaters) is also important to Antoine Carter of Groundwork Milwaukee, which has helped build 95 gardens and orchards throughout the city. Instead of hiring contractors, Groundwork employs neighborhood youth. It’s an opportunity to instill habits that can last a lifetime, says Carter. Some of the kids Carter has mentored have gone on to work on food and environmental issues. “But I’m just happy if they eat better, appreciate greens, and shop at farmers’ markets,” Carter said. But one could measure success by the growth of the Milwaukee Food Council, an umbrella organization for local food groups, whose membership grew from 20 to more than 60 over the last few years. And in surveys, more than half of VGI gardeners say their backyard gardens supply 25 percent of their fruits and vegetables. “Here’s what we can say for sure, more people in Milwaukee are growing their own food,” said Mead. Still, it’s likely that backyard and community gardens account for a small fraction of the food people eat—even in a local food mecca like Milwaukee. Many wonder if there’s a way to grow that percentage. Tim McCollow is working to scale up hyper-local, homegrown food to offer an alternative to the industrial food complex, in part by removing the hurdles gardeners face. In partnership with Groundwork, McCollow’s program makes it easy for would-be community gardeners to acquire land. The city is helping install rainwater storage systems and is looking into fitting the area’s abandoned warehouses and industrial sites with grow lights to enable year-round production. Will Allen of Growing Power also supports scaling up urban agriculture. 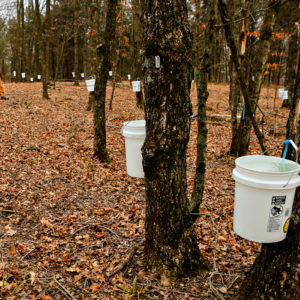 Rather than tinkering at the edges of industrial food, he wants to remake the whole system. “This is not a movement anymore. 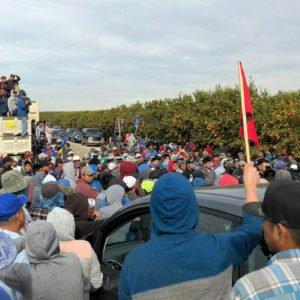 It’s a revolution,” he said. To that end, Growing Power has pushed the envelope of intensive agriculture. At its peak, its 20 farm sites in Milwaukee and Chicago have produced more than 1 million pounds of food a year on just 300 acres. Allen has made it a priority to bring that bountiful harvest to the most underserved areas—low-income communities of color where liquor stores are plentiful and supermarkets few. Allen’s vision of a thriving local food sector has fired up a new generation of food and gardening entrepreneurs—people like Damian Coleman, CEO of ELYVE Organics, a company that composts food waste from stores and restaurants and sells the final product through garden centers and nonprofit groups. “Racial tensions are so high that everything you do—or don’t do—is looked at through a racial lens,” added Mead of VGI. While Milwaukee’s urban gardeners embody those tensions, they also, on occasion, transcend them. Working together, or just hanging out, the crowd at Alice’s Garden spans the rainbow of humanity. Amazing story - keep up the good work. You are an inspiration. From where I will be going back to in Quebec the racial thing is not an issue but the government stopping individuals to sell their produce is and you have given me the inspiration to be part of the force that will change that. Cheers. Wow, Laurie! What a fantastic article! !